They had the 5 bedroom, 3 bathroom basement plan. We were impressed by their attention to detail in the homes they built. Their homes are Energy Efficient. Most upgrades are included in the price. Install a Water Line for an Ice Maker in Basement Family Room. Extend Front Porch all the way across the Front of the House so it is visually different than house next door. Pre-wire for Surround Sound Speakers in the Basement Family Room. After meeting with Jerry and getting the response from him that these changes could be made, I then wrote up an Offer to purchase the house and submitted it to their agent. So, as of September 24, 2010 we were under contract to purchase a home to be built on Lot 9 in High Meadows.If you need assistance with purchase a new home, please give me a call! I would love to help you. Mill Branch Subdivision in Grovetown, GA was one of the neighborhoods in the area that Crown Communities took over and introduced an entirely different home design from the original neighborhood concept. The banners at the entrance to this Crown Community announced maximum square footage for minimum price. I thought it would be good to see a yearly over view of the home sales in Mill Branch to see exactly how the price per square foot would average out for all 51 of the homes that sold this year. I will break this out by quarter. The original development in Mill Branch consisted of all brick construction with mostly ranch style houses on larger lots. These homes were under 2,000 square feet with tiled floors, 2 car garages and in-ground irrigation systems. Crown Communities brought in Super Sized houses with huge master suites and only the front of the house is brick. (The other 3 sides are vinyl siding or Hardy Plank.) Now, for the tricky part of explaining the price variations. The lowest priced house that sold in the Fourth Quarter was one of the original homes in Mill Branch and was a VA foreclosure and doesn’t factor in with the new construction pricing. The highest priced houses in the subdivision are mostly basement homes and those would include an extra fee to finish off that space. I did not see 1 home that sold that was 4,100+ sq ft for the $160,000 price tag. Why is that? Well Crown is a builder that offers a basic package (which doesn’t include the automatic garage door openers or ceiling fans in all the bedrooms). If you would like the motor on your garage door then you have to pay an extra fee; otherwise, you will have to manually open the garage door to pull your car into or out of the garage. Any deviation from the standard package will cause an additional charge for any extra items or upgraded items. If you are looking for maximum space, then these houses will be good to consider when house shopping.When you are shopping in a New Construction neighborhood, please be careful and read the fine print. If you need help with buying a new home, please consider calling me or another licensed Realtor. It never hurts to have someone representing your best interest as a buyer! The least expensive home that sold for $122,00 in Euchee Creek over the past year was a VA foreclosed property. This property went under contract in a little over 30 days. It appears to have been purchased by an investor in November and is now available as a rental.The most expensive home that sold for $170,000 back in May was not a brand new home but a resale. 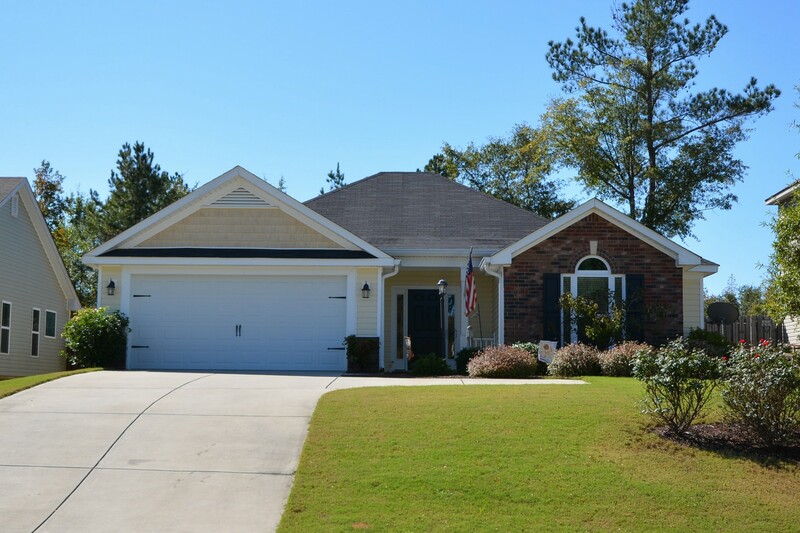 This home had a few upgrades – tiled back splash in the kitchen and ceramic tiled floors in the kitchen – and was sparkling clean with neutral paint colors and almost an acre sized lot.If you are searching for an all Brick Home, please take a look at the Homes for Sale in Euchee Creek. If you would like to receive a copy of my Euchee Creek Market Update please send an email to susan.macewen@kw.com. Back in April I wrote a post on a new subdivision being developed in Grovetown, GA called Magnolia Station. When I spoke with the developer, Mr. Todd, he wasn’t sure which builder would build the houses. His thoughts at the time were that the new houses would be similar to the ones in the Euchee Creek Subdivision which is right across the road. Well, as I was pulling out of my subdivision of Euchee Creek late in the afternoon on Thursday, I saw the big red & black Crown signs being installed. I do know that initially the plans for Magnolia Station were to include a club house and community pool. Since Mr. Todd has turned the development over to Crown Communities I am not certain if that plan is still in place. Hopefully it is! The new subdivision of Magnolia Station will feature the standard 4 to 5 bedroom homes offered by Crown with up to 4,300+ square feet and will start in the $160,000 range. Please remember that this price will be the starting price for the standard home plan. Also, don’t forget to consult with a Buyer’s Agent! Buyer’s Agents will help navigate you through the buying process and will represent your best interests. If you would like more information on the Magnolia Station community or any other New Home Subdivision, please send me an email or give me a call at 706-294-6795. I would love to be your Buyer’s Agent! Hello! Way back at the beginning of the year I posted an article about selling our current home so we could buy a new, larger home. Well, due to several obstacles we never got our house on the market to sell. My family, well mostly our children, haven’t been very cooperative in the process! But that is okay, because with the current interest rates being so low and maintaining our good credit rating we still qualify to buy our new home!!!! Same School District we are currently in. My plan is to post pictures and notes along the way during the construction of our new home. I know there will be a lot of excitement and even some challenges along the way! If you are interested in seeing any of the available Homes for Sale in High Meadows, please give me a call at 706-294-6795. I would love to show you the neighborhood. Grovetown Home Sales during the month of July were lower than June with 61 single family and townhouses closed compared to 96 for June. There is usually a slight decline during that period because of vacations and the July 4th Holiday. Here are the stats for the area very quickly. The leaders in the area were once again neighborhoods with new construction. Ivy Landing was the winner for Grovetown 2CO with only 4 Homes Sold and Canterbury Farms was the winner for Grovetown 4CO with 7 Homes Sold during the month of July. If you have a question about purchasing Grovetown Homes for Sale, selling or investing in Grovetown real estate please free to contact me. After all, I am here to answer your questions!